We live where there is a lot of snow, and this means winter sports. Because we may hate the cold, but we might as well make the best of it. We love road trips so finding the best ski hills in Alberta was one of the things we wanted to do this Winter. Here are the top 5 hills in Alberta. Marmot Basin- This mountain is one of the best kept secrets, located in beautiful Jasper National Park. It doesn't see the volume of visitors that Banff and Lake Louise see. Winter in Jasper is actually considered the "off season", meaning hotel accomodations are discounted. Day lift tickets start at about $85, but if you really want more bang for your buck then I would suggest "Jasper in January" a special event that sees ticket prices and accommodations discounted. Sunshine Village- Known as Banff's "other" mountain, I chose this because it is less frequented then the better known Lake Louise. If you don't have an aversion for a lot of people then check out Lake Louise. If you are like me then check out Sunshine Village you will not be disappointed. A day pass goes for about $98. Misery Mountain- In Peace River Valley is Misery Mountain, this place is great if you are on a budget. Adult lift passes are only $26 and lift, lesson, and rental packages are only $52.43 this is great if you are a beginner as other resorts charge a lot more for lessons alone. They also have Five-dollar Fridays where you can ski for just $5! Nakiska- Home to the 1988 Winter Olympics, and located in Kananaskis. Not only is the mountain worth it but the drive down is beautiful, the scenery is jaw-dropping. Nakiska offers 3 lifts and 64 marked runs. You can feel what the Olympic teams felt racing down the mountains. A day pass is about $70. Castle Mountain- If you have a bit of a daredevil streak then this mountain is for you. It is one of the few places that has Cat Skiing. 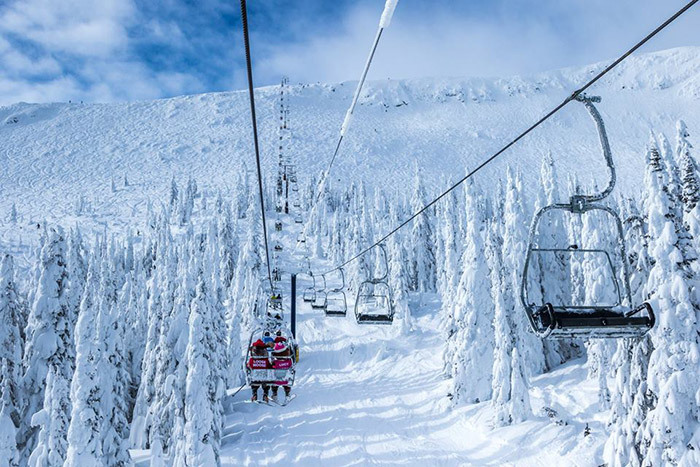 Their Powder Stagecoach will meet you and take you up Mount Haig to access your personal powder lines. Can you imagine skiing where no one else has been? Fresh, untouched powder! It sounds amazing, it's about $350 per person but if skiing is your thing then this adventure just might be worth the money. What is your favourite ski hill? Where should we head to next?